Google Apps Backup Tool Solution! 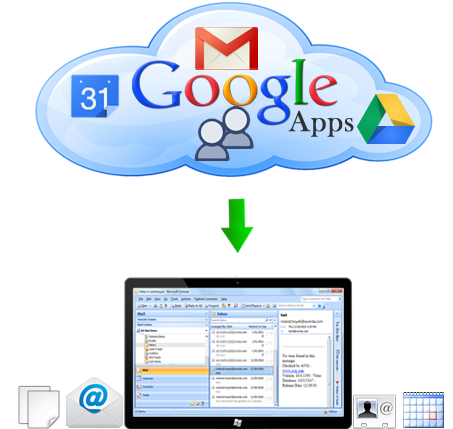 Google Apps Backup software is developed with the sheer technology so that user can easily create backup of emails, Google Apps contacts, calendars & documents for their Google Apps account and preserve them from lose. With Its advance peculiarities user can not only create a backup for their emails, contacts, calendars & documents, but they can also transfer entire email, calender, contact safely with the reliable software. This advanced application is designed by the organization with maintaining quality thus users can create backup while keeping all the data intact. This proficient application creates a backup in much less time than other application available in the online software industry. In case multiple Google Apps accounts are to be backed up, the tool gives the option to import a CSV file with required credentials in it. Double-click the password will exclude the account from backup creation process. 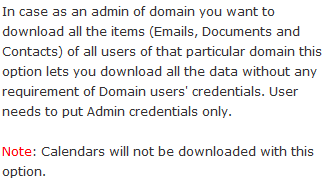 The software allows users to take backup of single account and asks for the domain name and password for it. The software also gives opportunity to fetch required details directly from Server when required. With our innovative solution, crucial contacts can be converted to vCard. For every contact, a vCard will be created by the tool where all the required fields will remain intact after conversion. For backing up calendars, the software allows converting them to ICS file format so that schedule sharing through network is made possible through ICS file supportive applications like Thunderbird. The software gives a platform to backup crucial documents of Google Apps by downloading them on machine and saving them to their revised supported file format like DOCX, PPTX, XLSX etc. Try Backup Tool For Google Apps and Get An Installation Key! User can check the working capability of the software to create backup of Google apps with its trial version before investing in its commercial version. User can download this reliable utility in just few mouse click and install the application at free without paying anything. With this free trial version user can successfully create a backup of the 100 email items & 25 other items (contacts, calendar & documents) from a Google Apps account. With this demo version user get the confidence to work with the licensed version. Purchased Version - Google Apps Backup Tool! With the free version of the software user can create backup of only 100 email items & 25 other items (contacts, calendar & documents)per folder but with the commercial version of the software, user can create backup for the entire Google Apps account. User can install the licensed version of the software by just spending nominal amount. Once users install the software they can create a backup by maintaining a hierarchy of folders. User can install the software without interfering with the trouble as the commercial version of the software is complied with the simple user interface. Copyright © 2013-2019 BKF Repair Tool | All Rights Reserved.